To Sum It Up: Because Cassel Sharpe is a transformation worker, one of the most powerful magic users there is, his talent is highly prized by both the good guys and the bad guys. He’s supposed to be joining the Feds, but his future career as an agent troubles him because it’s in direction opposition to the profession that the love of his life, Lila Zacharov, is entering. She’s preparing to take over the family business from her crime boss father. Lila’s dad is also keeping Cassel’s mother in his Manhattan apartment until the diamond that she stole from him is returned. There’s no such thing as the simple life for Cassel, and when the Feds want him to use his magic for a dangerous operation, he knows that he’ll need every bit of cunning he possesses to get out of this situation alive. Review: Our favorite snarky curse worker, Cassel Sharpe, returns for the final chapter in his story, and he finds himself in his biggest bind to date. And that’s really saying something, because his previous escapades have included transforming his best friend into a white cat and solving his oldest brother’s murder. Black Heart is every bit as gripping and suspenseful as the previous Curse Workers book, Red Glove, was, with enough plot twists of its own to constantly keep you guessing as to how it will all end. Black Heart opens with Cassel and his brother, Barron, who’s now working for the Feds, too, in the midst of a little training exercise. They’re tailing Lila Zacharov, heir to her mobster father’s criminal empire and the love of Cassel’s life. Picturing Cassel and Barron sitting in Cassel’s car trying to avoid being seen by Lila made me laugh because it was like a scene straight out of a buddy cop movie. The idea of Barron, a former employee of Lila’s father, as Cassel’s training instructor made me laugh even harder. I’ve never been very fond of Barron; he’s always struck me as the type of guy whose number one priority is himself. I was amused to see that becoming a federal agent didn’t make him any less smarmy or arrogant than he was during his very recent days as a criminal. One of my favorite things about this series is how just when I think I have things figured out, Black throws a few curveballs. Well, in this case, I never pictured sort of liking Barron, but I did by the end of this book. In Black Heart, we catch a few fleeting glimpses of a different side of him, not that he turns into a saint or anything. I’ve always loved how gray the characters are in these books; the moral boundary between the good guys and the bad guys is wonderfully blurred. As for the younger Mr. Sharpe, Cassel’s knack for extricating himself from sticky situations is really tested here. He’s slated to officially join the Feds once he graduates from high school, but in the meantime, they have a small task for him. The governor of New Jersey’s efforts to get his anti-worker legislation enacted into law have obviously garnered him some enemies, Lila’s father among them. Zacharov had Cassel’s mother, an emotion worker, use her magic on Governor Patton to make him drop his agenda, but the attempt failed and has left Patton extremely unstable. Patton has become so dangerous that the Feds, who count curse workers among their ranks, have concocted a plan to have Cassel transform the governor and thus remove him from the public eye permanently. Coming from a family of con artists like he does, Cassel doesn’t completely buy the Feds’ assurances that they’ll do everything possible to keep him safe during the mission. In fact, Cassel suspects there’s a double-cross in the works. The conclusion to this showdown is as surprising as it is thrilling, not to mention ingeniously plotted. I was flabbergasted by the way in which events panned out; Black wrote these scenes brilliantly. I found the subplot in which Cassel and his friend Sam try to help a classmate who’s being blackmailed a bit extraneous, especially compared to the high drama of the Governor Patton storyline. Otherwise, Black Heart is a compelling read that should leave fans of The Curse Workers very content. I’ve really grown to like this series, and I’m going to miss it. Should Holly Black ever decide to write about this world and these characters again, it’ll be a very happy day indeed. All in All: The Curse Workers is an excellent series and a must-read for anyone who likes books about magic, or even if you enjoy books in which the distinction between the heroes and the villains is not so clear-cut. And with Cassel’s engaging, humorous narration, you’ll never be bored while reading this trilogy. I can't wait to read this series, it sounds awesome !! I really have to pick up a copy of White Cat soon ! !Thanks for the review Lee. I really enjoyed it and thought it just kept getting better as it went along. I hope you like it as much as I did! I loved this series. I was sad to see it end. I would definitely love to read more about these characters if she ever wrote more books. As much as I liked how the series ended, I was sad that it was all over. I'd love to read more of these books, too. Definitely! Originally, I wasn't in a rush to get a hold of the second and third books, but I'm glad that I ended up reading them when I did. I know how you feel, Katja! There are quite a few books that I keep reading about that are sitting on my shelf, sad that I haven't gotten around to reading them yet (Divergent, Obsidian, and more). This sounds fun, I'll be checking out book 1 of this series plus the cover art is gorgeous! It is a fun series- I hope you think so, too! 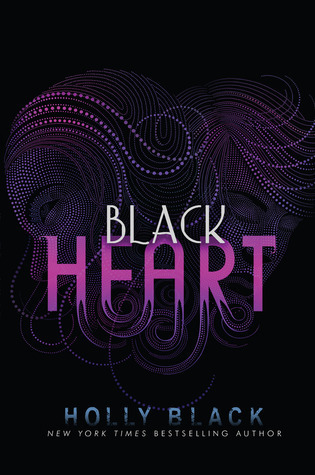 I believe that the covers of the previous books have been redesigned to match Black Heart's cover. The copies of White Cat and Red Glove that I borrowed from the library had different artwork that was also pretty cool.